As more camcorders start employing alternative media to record videos, such as hard drives and memory cards, the traditional magnetic tape is starting to fall to lesser usage. Conversely, an abundance of Mini-DV and even 8mm video camcorders are still in use today. In fact, High Definition Video (HDV), which records on regular Mini-DV tapes, is still popular among some professional videographers. Whether it's for audio, video, or data storage, magnetic tape has always been a delicate medium, even though some formats have proven to be appreciably more durable than others, such as VHS. At some point we all had or at least know someone who had their tapes broken or "eaten by the machine". At Ted's Video Services, we specialize in repairing audio and video tapes. 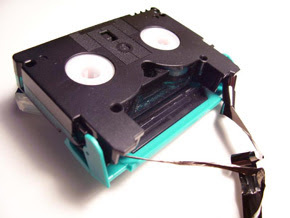 Specifically, we repair those broken or "eaten" tapes, but we cannot recover lost recordings. Our Video Tape Repair Service has been a blessing to customers, but it also means they have permanently lost some seconds or even minutes of some of their precious memories due to tape damage. Be cautious of what brand video tapes you buy. Unfortunately, even name brand tapes can be susceptible to high failure. When you find a brand and model tape that works well with your camcorder (no drop outs, etc. ), keep using it. Different brands of Mini-DV tapes use different types of lubricants (dry vs. wet), and thus it has been recommended that you do not mix brands of Mini-DV tapes in your camcorder. Always have a video head cleaning tape, but do not overuse it, because this causes more wear on the video heads. Store tapes in a cool, dry place, and far away from strong magnetic fields--like those generated by large speaker drivers or AC transformers found in powered subwoofers and A/V receivers. And for crying out loud, don't leave tapes on top of equipment that produce heat! When videotaping, be careful when moving between drastically different environments. Instructions manuals for camcorders usually specify the ideal operating ranges for temperature and maybe humidity. If moving from a cold to warm environment, condensation may occur within the video camera, so let the camcorder and tape get acclimated to their new surroundings before continue shooting. On the spine of all audio and video tapes, there is a small square tab or sliding cover which, when removed, will prevent accidental recordings. All too often I see customers bring in tapes in the condition that would allow them to be inadvertently recorded over. I recall one customer who accidentally recorded over his own wedding video! IMPORTANT NOTE: On 8mm video tapes (i.e., Video 8, Hi-8, Digital 8) erasure prevention is a bit counterintuitive. That is, "opening" the tab in these 8mm video tapes allows erasure. Blank tapes often come with little pamphlets of guidelines on usage and maintenance. It is advisable to take a minute to look these over, because there may be information that is unique to that particular tape. Finally, do not reuse tapes. Blank media is relatively inexpensive now. Even in this economy, it is not the time to be frugal if you're going to be shooting something important, like your baby's first steps. Obviously magnetic tape, even for digital recordings, are prone to wear and tear, and don't get better with time. You want to transfer your audio and video tapes to more durable formats like CD, DVD, or hard drive. Although not mandatory, we always advise customers to transfer their audio or video tapes once they have been repaired. If you have a tape in need of rescue, please contact Ted's Video Services at (510) 796-2200 or (800) 221-1108, or E-mail info@tedsvideo.com. We're here to help. This is fantastic information for blog. I really love the way information presented in your post. I have added to you in my social bookmark…and I am waiting your next post. I am in your support. Keep it continue. That's great and having a lots of information for me. Thanks for post.